Torrential rains and widespread flooding throughout southern Alberta on Thursday washed out roads and bridges, sent residents scurrying for safety, and delivered up surreal scenes of cars, couches and refrigerators just floating away. The RCMP put out a call for help to the Canadian Armed Forces, which sent in two helicopters and a Hercules aircraft to help extract people stranded by water. Ron MacDonald surveyed the waters of the Elbow River rising quickly in front of his home in Calgary’s Mission neighbourhood on Thursday, a storm drain disappearing, inch by inch, under the muddy brown current. “I’ve been here 23 years and I’ve never flooded, but my neighbours have. It could be worse than the last flood,” said Mr. MacDonald, one of thousands of residents currently under mandatory evacuation order, as the city prepared on Thursday night for water levels that have not been recorded in decades. Officials said as many as 100,000 people in low-lying neighbourhoods could be forced from their homes, an evacuation that would take place in stages over the next few days. Residents may not be able to return to their homes for up to one week, officials said. Alberta communities, including Canmore, High River, Bragg Creek, in state of emergency. Calgary Mayor Naheed Nenshi is urging residents affected by flooding evacuation orders to “gather your valuables and go,” while telling the city as a whole to avoid all non-essential travel on Friday. “The message tonight is that we are still expecting that the worst has not yet come in terms of the flow,” Nenshi told CBC News early Friday in a telephone interview from an emergency operations centre. “The dams will crest on both the Bow and Elbow river over the course of the next little while and the downstream impacts will be significant. “If you live in any of the neighbourhoods that have now been affected by the mandatory evacuation it is time to leave. Gather your valuables and go,” said Nenshi, who returned early from an economic development trip in Ontario to deal with the flooding response. The flooding in parts of southern Alberta has a dozen communities under a state of emergency, and in Calgary evacuations could affect up to 100,000 people. PARIS—President François Hollande rushed to Lourdes on Thursday after the city’s holy shrine was inundated by flash floods that severely damaged facilities, compromising summer pilgrimages for millions of Catholics. The government declared Lourdes and the surrounding area a disaster zone after three people died in flooding caused by melting snow from the Pyrenees Mountains and heavy rain earlier this week. 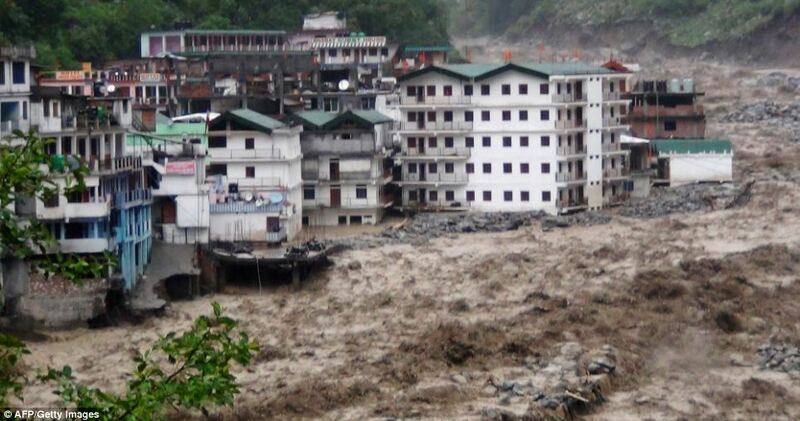 Flood death toll in India hilly states climbs At least 130 killed. Comments Off on Flood death toll in India hilly states climbs At least 130 killed. At least 130 people killed and thousands displaced after torrential rains devastate two states in northern India. At least 130 people have been killed and 70,000 others left stranded in devastating flash floods to hit northern India, private television channel NDTV has reported. The channel said on Wednesday that thousands of houses in the states of Uttarakhand and Himachal Pradesh had been swept away in the floods and authorities were using helicopters to evacuate people and drop essential food supplies. Northern India has witnessed torrential rains at least three times more than usual over the past week ever since the annual monsoon broke a fortnight ahead of schedule, leaving thousands of pilgrims and tourists stranded, officials said. Entire villages washed away – June 17, 2013. Comments Off on Entire villages washed away – June 17, 2013. At least 23 people have died and 50 more remain missing after torrential downpours in northern India swept away roads, buildings and vehicles. One building collapse today killed at least three people who were washed away when an entire apartment block toppled into a river, a government spokesman said. Most of the destruction is concentrated in the state of Uttarakhand, where the Ganges river and its tributaries are flowing at dangerously high levels. Experts Warn Extreme Weather Is Growing More Intense, More Frequent. Scientists and experts gathered at the eighth annual energy conference at the New York Institute of Technology in Old Westbury on Thursday to discuss extreme weather patterns, which they say are growing in intensity and frequency. “We’re seeing an increase in the extreme events and increase in damage associated with them as we’ve become more vulnerable,” said Louis Uccellini, Director of the National Weather Service. An unusually wet spring has swollen the Danube, the Elbe and several of their tributaries across Austria, the Czech Republic, Germany and Hungary, forcing the evacuation of tens of thousands of people, disrupting rail and road traffic, and causing damage that preliminary estimates have predicted will reach several billion dollars. The authorities in Budapest had declared a state of emergency Tuesday, anticipating that the Danube’s water level would reach record highs in the north of the country. The Danube was expected to peak at 8.95 meters, or about 29 feet, Sunday night or Monday morning. That would exceed the record of 8.6 meters, set in 2006, but remain shy of the 9.3-meter height of flood walls protecting downtown Budapest. Hungary deployed 7,000 soldiers, supported by several thousand volunteers, to reinforce dikes along the river. State television showed Prime Minister Viktor Orban at work near the city of Esztergom, north of Budapest. In the eastern German city of Magdeburg, the Elbe rose faster and higher than expected. The authorities asked more than 23,000 people to leave their homes as the waters reached 7.46 meters, almost 24.5 feet, on Sunday. Germany’s swollen Elbe River breached another levee early on Monday, forcing authorities to evacuate 10 villages and shut down one of the country’s main railways amid some of the worst flooding central Europe has seen in years. The swollen Elbe River breached another levee early Monday on its relentless march toward the North Sea, forcing German authorities to evacuate 10 villages and shut down one of the country’s main railway routes. As the surge from the Elbe pushed into rural eastern Germany, there was some relief further upstream as the river slipped back from record levels in Magdeburg, the capital of Saxony-Anhalt state. To the south, the Danube hit a record high Sunday evening in the Hungarian capital, Budapest, then began to ease back Monday. Officials said the city escaped significant damage, and Prime Minister Viktor Orban said soldiers and rescue workers would shift their focus further south. Weeks of heavy rain this spring have sent the Elbe, the Danube and other rivers such as the Vltava and the Saale overflowing their banks, causing extensive damage in central and southern Germany, the Czech Republic, Austria, Slovakia and Hungary. At least 21 flood-related deaths have been reported. The German city of Magdeburg grappled over the weekend with water levels more than 16 feet (5 meters) above normal, though the Elbe retreated by about a foot (30 centimeters) on Monday. More than 23,000 residents had to leave their homes on Sunday, but officials said an electricity substation in the city was no longer in danger of flooding – which would have made the situation worse by cutting off power to the drainage pumps. But further downstream, a levee at Fischbeck, west of Berlin, was breached overnight, prompting officials to evacuate 10 villages in the area. Floodwaters from heavy rains swamped five countries in Europe and threatened others, leaving at least eight people dead and nine missing. Germany, Austria, Poland, Switzerland and the Czech Republic have been affected, with officials in the Czech capital, Prague, closing the subway system, evacuating thousands of homes and warning other people not to come into the city. Slovakia and Hungary were preparing flood defenses on the Danube River. In Germany, rain levels that reached record highs in May contributed to widespread flooding across southern and eastern parts of the country. In the southern state of Bavaria, more than 20,000 firefighters and other rescue workers were battling rising water levels, especially in the southeast. The historic cities of Passau and Rosenheim declared states of emergency. Rescue workers and volunteers were filling sandbags, erecting temporary water barriers and helping to evacuate homes Monday morning, according to Passau’s crisis management team. The German Army deployed more than 1,000 soldiers to Saxony and 600 to Bavaria to help with rescue and protection measures, and the air force sent helicopters to help with evacuations, officials said. Chancellor Angela Merkel planned to travel to the worst-hit areas on Tuesday. In the eastern German state of Thuringia, more than 7,000 people had to spend the night in temporary shelters. In the Czech Republic, six people were dead and five were missing, despite more than 14,000 firefighters evacuating the homes of 7,000 people and carrying out 256 rescues, said national Fire and Rescue service spokeswoman Nicole Zaoralová. Spring showers are unrelenting in areas of Europe where days of rain have sparked serious flooding. NBCNews.com’s Dara Brown reports. Czech officials declared a state of emergency and closed the subway system in Prague for the first time since devastating floods struck in 2002. People were urged not to travel to the capital, as waters of the Vltava River reached critical levels and threatened the city’s ancient center. “The situation in Prague is still not stabilized,” Zaoralová said. 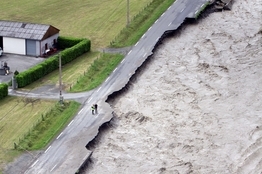 In Austria, two people died, including a cleanup worker killed in a mudslide near Salzburg. Three more were reported missing. Train lines in many parts of northwest Austria were suspended Sunday due to landslides. In just two days, Austria had experienced as much rain as it normally would in two months, the Austrian meteorological center said. This weekend saw many southern German towns struck particularly hard. “In the past three days, more than 400 liters of rain per square meter [about 10 gallons per square foot] were measured in many regions that border the Alps,” meteorologist Klaus Lessmann from German public broadcaster ZDF said. The German Weather Service, DWD, reported Monday that Germany had not seen such extreme soil moisture in the past 50 years. “Many fields are completely saturated and cannot hold more water,” Johanna Anger from the DWD said. Many residents in affected towns and villages were without power overnight and as a precautionary measure, many schools were kept closed on Monday. Evacuations were also taking place in Poland and Switzerland. Authorities are bracing for more chaos across Central Europe as heavy rain continues to pound the region. Rail lines were closed in the Czech Republic and homes were evacuated. Flood barriers were erected in Prague for the first time since 2002, when the capital was crippled, with whole districts under water and animals drowned in the local zoo. The Danube and other Austrian rivers have flooded, swamping entire villages, with some houses covered to the first floor. The fire brigade worked overnight to pump out cellars and important infrastructure buildings and to keep the roads clear. An electric power station is under water in Salzburg. In Germany, Passau is intersected by three rivers, including the Donau, which has already burst, covering streets and a bridge with water.